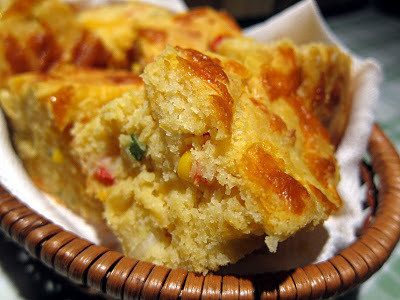 There is something so comforting when you dig into a piece of warm, slightly sweet cornbread. You can't help but smile and take another bite, then another, then another. Ina's basic cornbread recipe is really good and it allows for tweaking to add your own personal spin. I decided to use buttermilk instead of milk and added one more egg to the batter. I also added a sweet red pepper, scallions and sweet corn. For heat, I added cayenne. 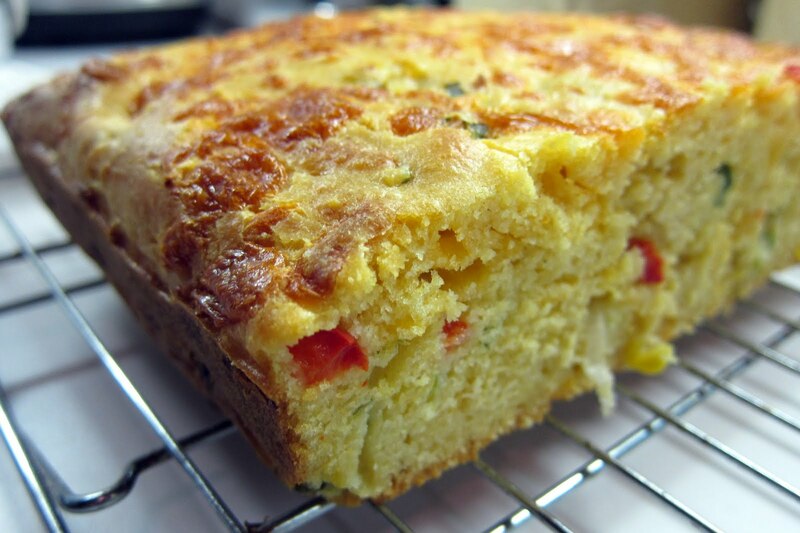 This cornbread is just about perfect and I will be making this again and again. Enjoy! 1. 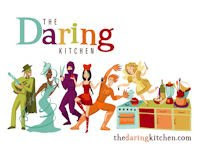 Combine the flour, cornmeal, sugar, baking powder, cayenne and salt in a large bowl. 2. In a separate bowl, combine the buttermilk, eggs, and butter. With a wooden spoon, stir the wet ingredients into the dry until most of the lumps are dissolved. Don't over mix! 3. Mix in 2 cups of the grated Cheddar, the scallions, red peppers and corn. Allow the mixture to sit at room temperature for 20 minutes. 4. Meanwhile, preheat the oven to 350 F. Grease a 9x13x2 inch baking pan. 5. 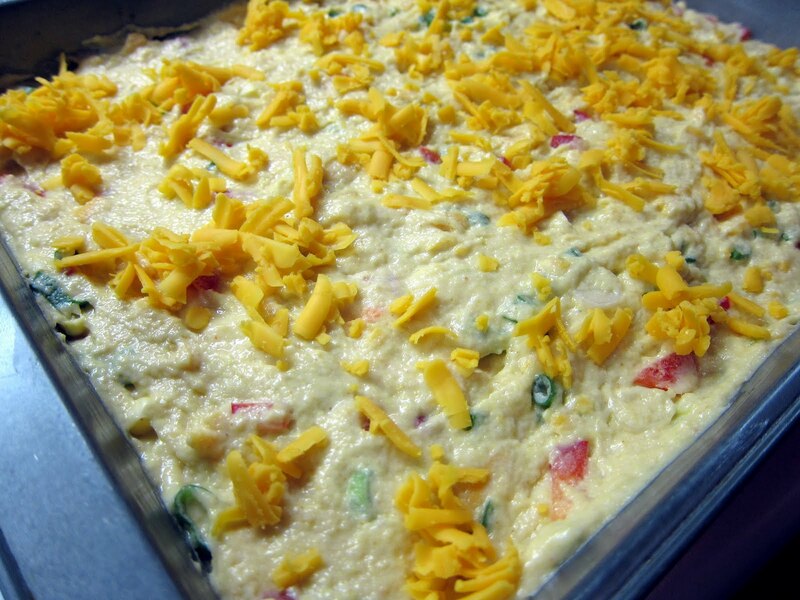 Pour the batter into the prepared pan, smooth the top, and sprinkle with the remaining grated Cheddar. 6. Bake for 30 to 35 minutes, or until a toothpick comes out clean. Cool and cut into large squares. Serve warm or at room temperature. 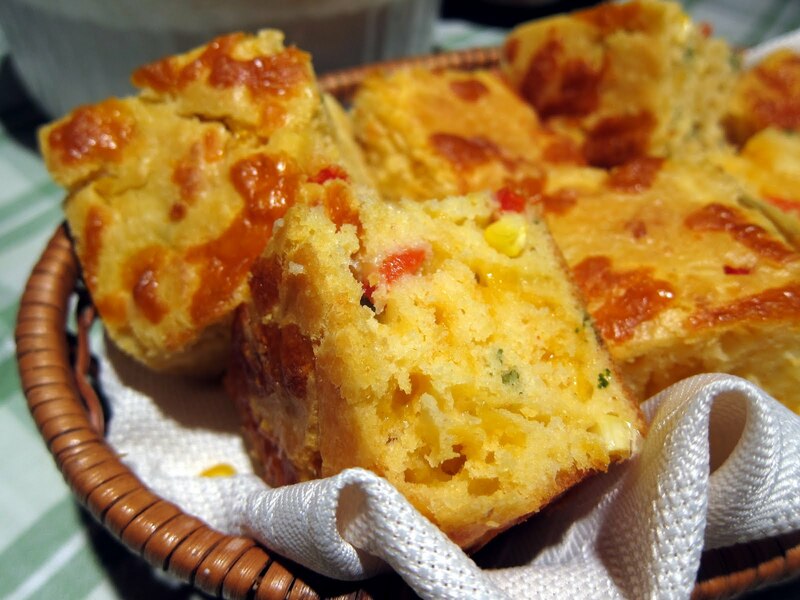 Cheesy cornbread seems juts about perfect right now. I had better hit the kitchen. All that goodness in cornbread. Not only do the add ins make it yummy but look at the color in there! Fantastic! Stumbled upon your recipe as I was looking for a cornbread recipe. Made it to go with chili for dinner tonight. It was fantastic -- so moist and light and chock full of flavor. Thanks for sharing!